Like the past few years, I'm sharing some of my favorite art from the past year. I already shared all my Pusheen art so I'm excluding those from this post. It's so hard to narrow down art from each month. I love taking my time to look back at what I've done over the year. January seems so long ago! Hi all! Today I have a super special custom made for me by the lovely Pam at Stella Chroma. I very last minute approached her and asked if she would make me a special polish to commemorate a tradition that my darling and I have. Back in 2009, we went to the Rockefeller Tree for the first time together. Then we did it the next year. Well, this year marks TEN YEARS of us going to the tree! We unfortunately weren't able to get there before Christmas (well, we were there before but it hadn't been lit yet). We finally went this week. A few years ago, he called it our "tree-dition" and I loved that term! Hence, the nail polish name! 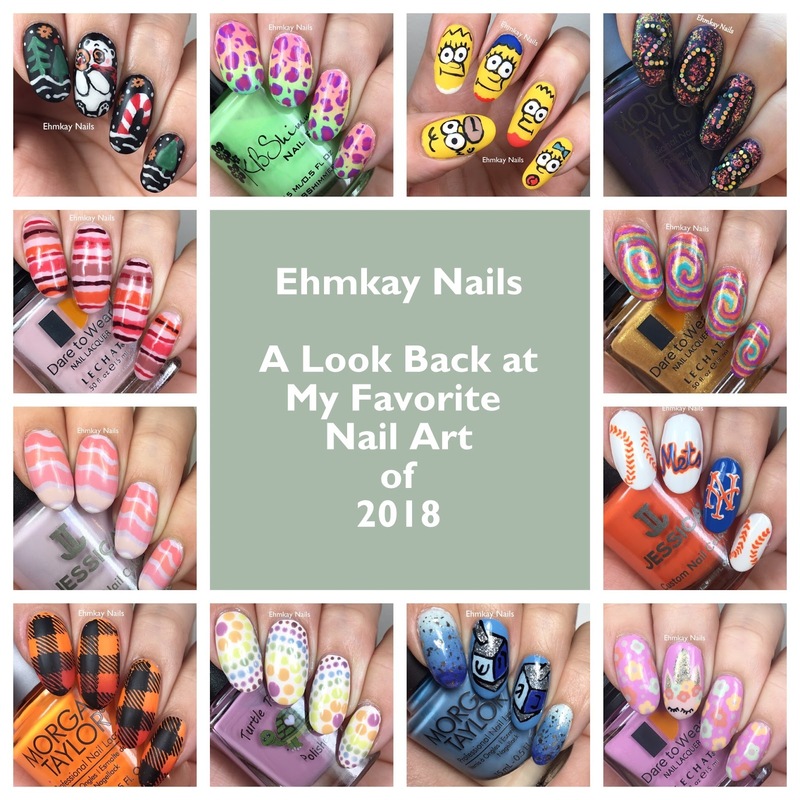 I really enjoy taking a look back at my nail art as the year comes to an end. I feel like I was very swatch heavy this year, so I like to remind myself of the art I did do! So first, let's start off with 2018 Pusheens! Doing one month is fun. Some looks I love, some I hate, but I always enjoy looking at them. SO take a look back at 2018 with me! Greetings all! I wanted to do something a little different today, as I started this a few years ago sharing nail inspirations from window displays around New York City. If you don't know, major department stores go all out with epic holiday window displays! Last year, I shared with you the full displays of the 2017 New York City Holiday Windows. You can see that post HERE. I finally got to get photos of Saks Fifth Ave last night, plus I wanted to wait in case any of my readers were going themselves and wanted to be surprised. I believe most will be taken down by January 2, so you still have a chance! I hope you're winding down from Christmas. I went to Lush and Bath and Body Works today and hit up some sales. I also grabbed lunch with a friend. Now I'm home because Christmas may be over but now we need to confront New Year's Eve that's just a few days away! I have this quick stamping look with another plate from Beauty Big Bang. Isn't it cute?! Merry Christmas! I had planned to post these yesterday but too many manis, not enough days! This is also my current manicure! Hopefully you can see my inspiration?! It's the Starbucks cup! When they debuted the cup after Thanksgiving, I immediately saved it and knew I would do a manicure with it! I love the muted colors, the simplicity, everything! So it's perfect for my manicure today for Christmas. I wasn't planning on posting this, but I did it, so why not?! 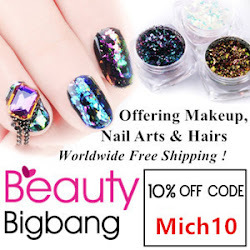 I was totally obsessed with the train image on one of the plates I received from Beauty Big Bang. I had posted a gift wrap image with it a week or so ago. Ok let's get to this quick NOTD because I'm off for my plans! So recently, I discovered Irotoiro Nails on Instagram. I really love her sort of childlike doodles and chalkboard feels of her art! As I scrolled, I saved a bunch of her gorgeous art, and I was inspired by this particular one for today. Now I have a ton of manis for next holiday season I want to recreate! I feel like the last 2 or so years, the red truck with a Christmas tree has been everywhere. I keep a list of manis to do and had this one on it from last year, so I'm getting around to it now. Of course, I've had a few bad days of nail art, lol, but I'm still sharing it. Hi all! Today is the last Pusheen mani of the year...and well, I don't like it haha. When I turned the calendar, I was like awww this is cute and wahhh I'm going to hate drawing it on my nails. I think that negativity went into the mani. I shouldn't end 2018 like this! BUT, I figured like always, I should share the manis I'm proud of and maybe the ones that might be fails. So enjoy my Pusheen fail? Can you handle more cute stamping?! This time it's a plate from Born Pretty along with a stamping polish! I'll be back with more images from this plate since there's some great wintry ones, but I got this plate just for this image. A bear encircled by strings? YES!!! Cats and holidays are just the best. I can't decide if they are Santa cats or festive party cats, but I'll take it. I mentioned yesterday that Beauty Big Bang released a bunch of awesome holiday plates. I definitely chose this one because of this cat image. It's hilarious! I got so many excellent plates for the holidays this year! I think like 6! So although I'll do some handpainted looks, I'll be sharing lots of gorgeous stamping plates! Even though you won't be able to get the plates for Christmas, there's lots of wintry images on the plates, so you can still grab them! Zoya has a bunch of great gift sets available for the holidays. You still have time to grab these for gifts OR you could definitely treat yourself and grab these for yourself! Sometimes it's so easy to get one of these gift sets and call it a day. I am not the greatest with gift giving. I just don't have the talent like others, so these are awesome for that! So today I have an untried that I've been looking at since June. Judge me haha. When I went to Indie Expo Canada, I received Boo Boo Butter as a press gift and I was able to grab a mystery polish with purchase. Low and behold, I got a Polish Pickup color from May 2018. This is one I totally forgot to buy (I usually get overwhelmed during PPU and just forget to check out LOL). So unfortunately, this polish isn't available but Girly Bits has an amazing array of holo shimmers with flakes, so this is a great representation of what she offers. I can't even with my nail art today! I was ahead of grading this past Monday and decided to treat myself to some time to myself to do some nail art. And oh my, I did! My local Starbucks had this adorable polar bear on their chalkboard wall. It was so so cute. So I snapped a photo. My darling said you're going to do that polar bear, snow globe and all, on your nails?! OH YES, OH YES I WILL. And I did! Happy Wednesday. I can't believe December is basically halfway through. It's like, just slow down! I'm also basically done with my semester. I give a final to my students tomorrowand I am so going to miss them! I have one more final next week and all done. It will give me time to catch up on some nail art before next semester starts. I have two new offerings from Alter Ego and if these don't give you winter vibes, then I don't know what winter is to you! I had a stroke of genius over the last few months and I've been writing down so many holiday manicures to do but man, it's not going to fit into my schedule. For example, the manicure I did today is sooooo cute, I won't take it off for a few days! Anyway, I received 3 new Christmas/winter plates and a stamping polish from Beauty Big Bang and I'm starting with one of the plates and the polish! I feel like it's time for the flakies to shine. They've come back for their moment! Alter Ego has released a new collection of five toppers. I actually already previewed one in last week's Chanukah Dreidel nail art! This collection is a nice variety of colors so let's check out all those shifts! Tonight is the last night of Hanukkah! I did this manicure on Sunday December 2 for the first night. I just took pictures of it today, Sunday, December 9th. I shared the initial manicure HERE. Well, I went to take it off and my dreidel nails were still looking perfect! My gradient nails though were a chippy mess LOL. So I decided to get extra mileage and just change up my outside nails. I did the same exact color palette and I think it came out cute. I can't believe I wore the same manicure for all of Hanukkah! More Jessica! This time, it's the holiday trio from Jessica Phenom. Phenom is another line of nail polishes that have a gel-like system. The polishes are supposed to last 10 days with their base and top coat, but no light is needed. I haven't worn a nail polish for over 7 days in years and 7 days is rare. These do last on me, but I can't confirm 10 days. Now, let's get back to Glam Wear! This collection is a different finish from their regular line. These shimmers are more vibrant with a bit of shift, so let's check them out. Oh hey there! Happy Hump Day! I'm back with more holiday collections and this time, this is a nice little trio from Jessica Cosmetics. These include three rich shimmers that are reflective. They are sparkly without being glittery, so that definitely fits with the holiday glam theme of this trio! Hi all! Happy Chanukah (or Hanukkah, which is the Americanized way of spelling). If you didn't know, it began Sunday night and I was rocking these nails. I actually did them and then not even an hour later was making latkes. Can you believe I didn't ruin them!? I was super excited that Morgan Taylor's new Forever Fabulous collection had some blues and silvers. There's always reds and greens for Christmas, but yay for other colors! Oh hey, Happy December! I'm kicking off the month with Girly Bits December 2018 Colors of the Month! She went with classic Christmas colors. Of course, if you don't celebrate Christmas, this is still a gorgeous red and green! I'm glad I got these up today, because there's a discount on the duo until December 10, but these will be available through January 1! Before I move into holiday art, I want to share two more Girly Bits polishes that released a few weeks ago. These a permanent releases, so yay! Girly Bits really had a ton releases this month. She had a lot of creative juices and it's been fun playing with her polishes this month! The Concert Series is an ongoing series which she adds to throughout the year. So to round out 2018, here's the last two! Polish Pickup is changing it up a little this month. Instead of the normal pre-order, every polish will be capped and ready to ship so that you can get your orders in time for the holidays. So please pay attention to the caps as some are very small! I have four polishes and a sugar scrub this month. Some makers took off this month and I totally get why! Enjoy the holidays and enjoy these polishes! I told you I would be back with more holiday collections and today's is super cool. Morgan Taylor is working with the estate of Marilyn Monroe and created this 12 piece collection inspired by her! There's also adorable gift sets. If you love Marilyn Monroe, you'll love these colors, which are available now. Two Pusheens in one month? That could never make me sad haha. I can't believe we are on the eleventh Pusheen mani! Next month is the last and where does time go? I realize time is the same, but each year seems to go by faster and faster, amiright?! Happy Monday after Thanksgiving. I feel like I'm still full. I cooked everything but the turkey, but honestly, it was like I cooked for 40 haha. Then there's Friday--I don't ever go out for morning shopping. I usually go out around 1pm and find they have the same deals that people did at 4am, so yea. Anyway, I feel like it's officially holiday season so I'll have a bunch of holiday collections. Let's start with Zoya Jubilee! Happy Black Friday! Are you shopping away? I do not go out to stores whatsoever. I just don't deal with that. I'll just click away and buy what I want from my very safe home haha. I have a new trio from Girly Bits that is available for only one more week! This month has been a month of Girly Bits. So many fantastic releases. Well, if you're already shopping for Black Friday, then click away and grab this awesome trio! This is available to Undies for Indies group members and anyone can join! HI all! Just a quick post to share my current manicure! I've been cooking all day and then went, ummm, I never took pictures of my manicure. So here we are, after hours of cooking and handwashing, and I'm taking pictures of this art! Hey, it held up well! Good morning! Hope you had a lovely weekend! I'm back with a cute plate that I received from Born Pretty. When I saw the mix of whimsical animals with accessories and flowery wreathes, I was like NEED. This is soooo cute! I held off using it for a while just because I was so backlogged with swatches, but I'm so glad I waited for the Girly Bits cremes to use them! 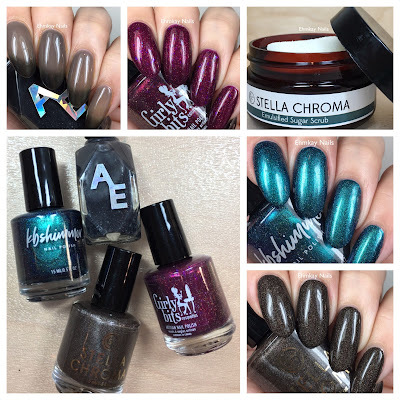 In addition to all the amazing polishes Stella Chroma will release (and you can check out those swatches HERE), she will be releasing a few new body care products, in addition to the ones she already carries! I have a review of all things body care on my blog today! So sit back and make a list, because you'll love what she has to offer! I have the Black Friday promos at the end of the post and don't forget you can use my non-affiliate code EHMKAY for 15% off. Stella Chroma Holiday Offerings & BLACK FRIDAY Deals! Oh my! Can you believe Black Friday is a week away?! I don't normally partake in the physical sales, but I do online! I'm just not one for shopping at 4am haha. Well Stella Chroma will be releasing three new mini collections on Black Friday. Instead of 3 separate posts, I figured I would give you all the information in one post because you're going to want these! One collection is limited and the other two have a special discount for a limited time, so don't delay next week! In addition, there will be new bath and body products, which I'll share in another post. And don’t forget, you can use EHMKAY for 15% off. I started this little thing of doing nail art to match my parent's wedding anniversary. It's silly, but I don't know, I just love it! Plus, I learn about new things. As they celebrate 38 years together today, I found out the traditional gift is Beryl. What in the world is that?! Well, it's actually a beautiful stone, which is said to "increase and preserve married love." Well, I didn't buy them any beryl (they really don't want gifts these days haha), but I did put Beryl on my nails! Girly Bits is becoming such a major stockist! If you didn't know, Girly Bits stocks a bunch of amazing indies, so it's really one stop shopping. Recently, she started carrying JReine and with that, comes one exclusive polish, Bits of Reinebows! There's also so many new releases, that you can just throw this in your cart! Oh hello! It's totally holiday time, even if you don't want to admit it! KBShimmer is about to drop a new winter collection on Thursday, November 15. There's some early Black Friday deals, and you will want to grab this collection up! Holos, crellies, magnetics, and flakies. What's not to like?! Grab your coffee and relax as you add up your wish list! I'm sharing two items in one post tonight. With all the special items per month, I run out of time! Indie Pickup continues next week and Alter Ego has a new color of the month, so let's take a look at these new products! Hi all! This is going to be quickly written because this Unicorn Pee collection debuted earlier today and immediately sold out. 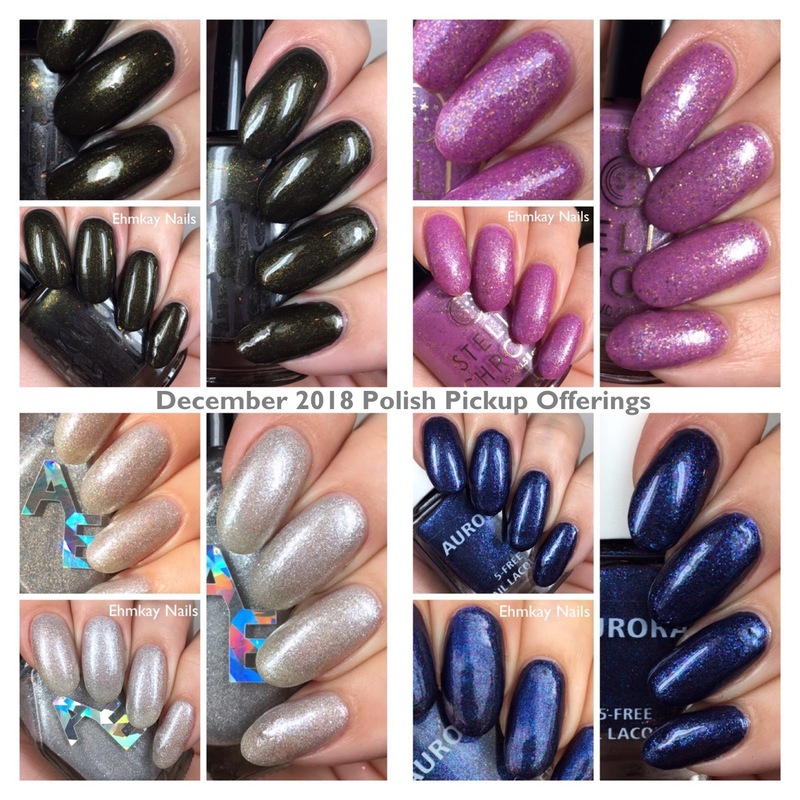 There will be one more restock TONIGHT 9pm Eastern and polishes will go quickly. If you missed out on polishes this morning, Girly Bits will be combining shipping. These feature a variety of unicorn pee pigments and each polish cost will vary, so please check the Girly Bits site! I'll be updating this post but I wanted to get you the pictures! Girly Bits has been making my life soooo hard. She sent over a bunch of new polishes and I've been wearing wayyy too many of them. I just can't even swatch them! I must wear them! You might recognize this polish from this nail art from almost a month ago! I couldn't tell you about this polish then, but here ya go! I wore it on its own for a few days before doing nail art. Sigh, I love this! 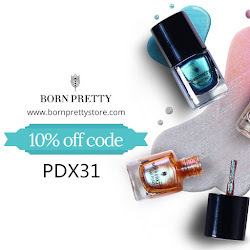 If you love nail art, then you love creme polishes! They create crisp looks without being distracting. I also love and only wear cremes on my toes! It's rare I use anything else. I also just love cremes. Girly Bits does it sooo right! First, there was the Warrior Goddess collection, and then there was the Fall 2017 Cremes. They blew my mind and a simple search on my blog will show you how much I use them! Now Girly Bits is back with Fall 2018 cremes, and I am ready to go! I showed you one art yesterday, and trust me, I'll have more! Hi all! So I didn't want to skip October's Pusheen calendar! Because I was doing my Halloween art, I figured I would do a Pusheen look. To my surprise, October's Pusheen had NOTHING to do with autumn or Halloween! So I decided to push it back. I'm okay with that, since the new Girly Bits cremes arrived and they are PERFECT for art! It's way more fun to do art when the polishes are all one coaters! Today I have a great multichrome duo from Fiendish Fancies! If you like multichromes, then I suggest you check out the Facebook group Multichrome Madness. They have custom polishes each month and share a love of all things multichrome. Ok, let's get to these! Happy Monday to you all! Today I'm sharing a group exclusive from Night Owl Lacquer. This is part of the Holomaniacs group, where they focus on holo customs from different makers each month. Well, Holo Love definitely has the holo in it and I love the extra components in it. This is available from November 9th-December 9th, so let's get to the details. Do you ever have a day where you are just like no? I thought we were finally in autumn, and then comes a 70 degree day with 93% humidity. This basically resulted in the major mess up you see below. I loved these decals and since I do want to wear them again, I didn't want to keep messing them up royally. Whomp. Anyway, I still wanted to share these! It's Colors of the Month time!! I love that Girly Bits does this, because it's a nice way to see new polishes without having to always invest in an entire collection. It's also nice and fresh to see what makers are working on. Well, I have to say, one of these polishes (I bet you can guess) has quickly reached one of my favorites of 2018. Acccckkkk, let's just get to it! Hello all! So tomorrow is November's kickoff to Polish Pickup. Because of my 13 Days of Halloween nail art, which ended yesterday (tear...I can't wait until next October), I didn't get a chance to post the PPU polishes. I've decided from now on, I'll be posting them all at once. I think I'll be doing this from now on. It'll be easier for you to add them all to your wish list at once too! LOL. Before my favorite holiday is over, I wanted to share a recap of all the looks I did. I didn't do as many Halloween manicures as I had hoped, but I also wore these arts for way longer than I had intended. That's okay! I really digged what I wore. So let's take a look at my 13 looks! It's my last Halloween art! I'll do a recap later today, but I wanted to share my art for today. Instead of a Halloween look with a pumpkin, I decided to match my costume! Because it's a Wednesday and I have to go to work, I found a work-appropriate dress that doubles as a costume! Then when I get home later, I can add fun makeup and take this baby out! So who am I? Sally from A Nightmare Before Christmas.